One of the areas of the Green Zone funding bid was to introduce different workshops and activities based around cycling and bike maintenance. This was an entirely new project to the estate. The importance of sustainable transport to reduce the use of carbon emissions and fossil fuel use was only part of the reason for these activities. There were the additional goals of increasing confidence, reducing isolation, increasing empowerment and working together with other members of the community. wanted the scheme to build on his work and to give him access to more tools and support if he or others on the estate wanted to take this further. who had links with existing activities that residents of the Estate were involved in, including a monthly bike ride around Manchester. 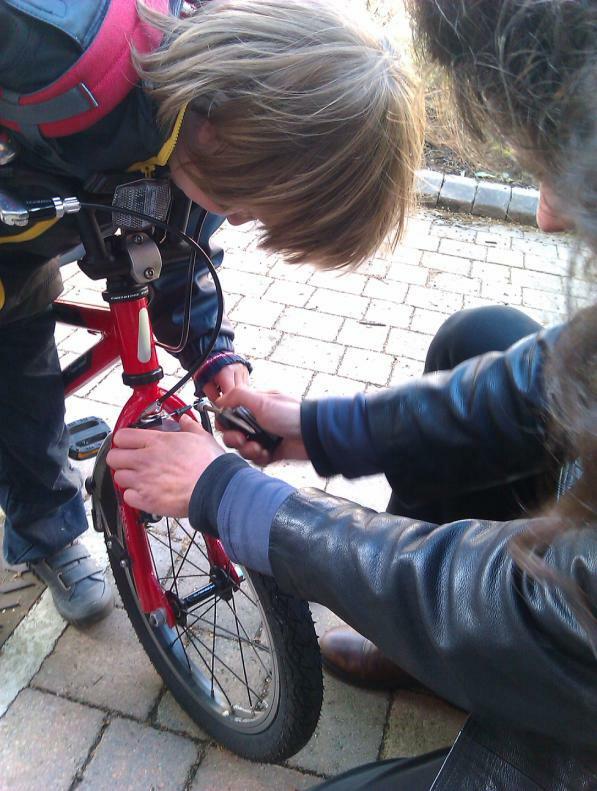 Run regular drop-in bike maintenance workshops called DIT bike workshops – “Do it Together‟. Create a tool resource: Source and buy a resource of tools that could be kept in a communal store cupboard on the estate and used by the community. Cycle Training: how to ride a bike, building confidence to ride on the road and also commuter training, tackling busier junctions and roundabouts in one-to-one sessions or in small group sessions. Women only bike maintenance class. Community Bike Ride; A monthly bike ride on the last Friday of each month, meeting at 5pm (or 4.30pm for a bike check). The ride helps to increase confidence and also enable people to meet other cyclists in their community. The ride joins with a larger Critical Mass ride in the city centre after 6pm. Pedal MCR designed a flyer to publicise all of these elements and it was put through the door of everyone on the estate. Although the flyer mentioned that the project was part of the Green Zone, there was a way of contacting the trainers from Pedal MCR directly. Earn A Bike: People volunteering their time in the workshop will be able to use their volunteering hours to “pay” for a bicycle or parts. Women-only bicycle maintenance and cycle training sessions to give women the skills and confidence they need to incorporate cycling into their lives. Heath and social bike rides which can help mental and physical health. 3 hour “Bike Basics‟ courses; Participants learn how to check that their bike is safe to ride, identify most common problems, repair punctures and replace a thrown chain.